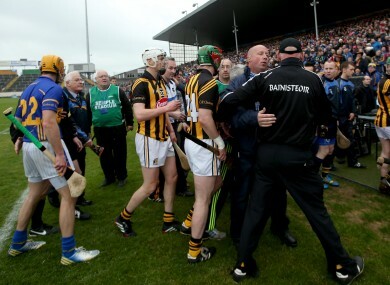 Brian Cody is restrained as the teams leave the field. KILKENNY MANAGER BRIAN CODY played down his touchline altercation with a senior Tipperary official following yesterday’s Allianz Hurling League final. Cody, who presided over an eighth League title success during his remarkable tenure, clashed with a member of the Tipp county board during the first half of Kilkenny’s dramatic one-point victory. Cody reacted angrily to an apparent remark aimed in his direction from the Tipp bench and having made his way into the opposition technical area, the James Stephens man hovered angrily over the Tipp bench. Verbals were exchanged before a clearly irate Cody made his way back down the touchline, as Tipp assistant manager Michael Ryan attempted to play peacemaker soon after. When asked about the flashpoint incident afterwards, Cody smiled: “I think I made a mistake in which bench I was at. That happens. We’re neighbouring counties, you know? Cody also hailed the composure shown by Kilkenny as TJ Reid engineered the game’s winning score at the end of extra-time. Reid played a brilliant ‘one-two’ with Richie Hogan before flashing over the decisive point from the New Stand side of Semple stadium, with the sliotar sailing over the Town End uprights. Cody remarked: “Yeah, obviously TJ likes to take line balls and score points with them. “It looked as if he was set up for it. It was good thinking, it was clever and it was good composure just to give it to Richie and to give it back to him. Cody was also impressed by the intensity levels on show and he declared that the Cats are in a better place than 12 months ago, when they beat Tipp in the 2013 League final at Nowlan Park. He added: “It was just mad stuff. We started off quickly. And they got back into it and then it dropped a bit and then we got back into it and then they got on top. And Cody declared: “We won last year and we didn’t perform particularly well in many of the matches. I would say overall, we’ve been better but as well as that, we’ve exhausted the panel fairly much. Email “Brian Cody plays down spat with Tipperary bench”. Feedback on “Brian Cody plays down spat with Tipperary bench”.